Microsoft just recently made official the introduction of a smaller and thinner version of their Xbox 360 at the E3 2010 in Los Angeles.Microsoft also reveals that the shipping of the new slimmer Xbox 360 has already started.The new Xbox 360 Slim will be available for sales by the end of this week. 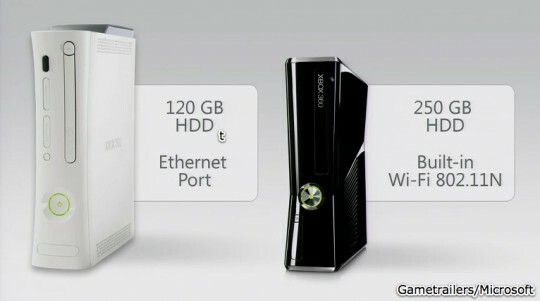 The new slimmer Xbox 360 from Microsoft comes included with a a 250GB hard drive and features built-in 802.11n WiFi connectivity, wireless controller, headset, HDMI input and USB flash drive storage capabilities.The Xbox 360 slim bundled with a one-year warranty as well. The new Microsoft Xbox 360 Slim will be available for sale with a price tag of $300 and the will be available at UK stores by July 16th. Tags:-Microsoft Xbox 360 Slim, Microsoft Xbox 360 Slim features, Microsoft Xbox 360 Slim specs, Microsoft Xbox 360 Slim specifications, Microsoft Xbox 360 Slim launch, Microsoft Xbox 360 Slim price, Microsoft Xbox 360 Slim price tag, Microsoft Xbox 360 Slim UK launch, Microsoft Xbox 360 Slim price details, Microsoft Xbox 360 Slim images, Microsoft, Xbox 360 Slim.